"I do things direct, and I have a system." RLJ Entertainment has unveiled a teaser trailer for the highly anticipated brutal crime drama Brawl in Cell Block 99, from filmmaker S. Craig Zahler, director of Bone Tomahawk. This is premiering at the Venice and Toronto Film Festivals starting this week, and we expect to hear plenty of good buzz when the first reviews hit. Vince Vaughn takes on the gritty, very serious role as a former boxer-turned-drug runner who lands in a prison battleground after a deal gets deadly. The full cast includes Jennifer Carpenter, Don Johnson, Tom Guiry, Marc Blucas, Udo Kier, Rob Morgan, Geno Segers, and Fred Melamed. This teaser doesn't reveal too much of what happens in prison, but it does introduce us to Vaughn's character. I'm totally down for this - I'll be watching in Venice soon. Bring it. In the film, a former boxer named Bradley (Vince Vaughn) loses his job as an auto mechanic, and his troubled marriage is about to end. At this crossroads in his life, he feels that he has no better option than to work for an old buddy as a drug courier. This improves his situation until the terrible day that he finds himself in a gunfight between a group of police officers and his own ruthless allies. When the smoke clears, Bradley is badly hurt and thrown in prison, where his enemies force him to commit acts of violence that turn the place into a savage battleground. 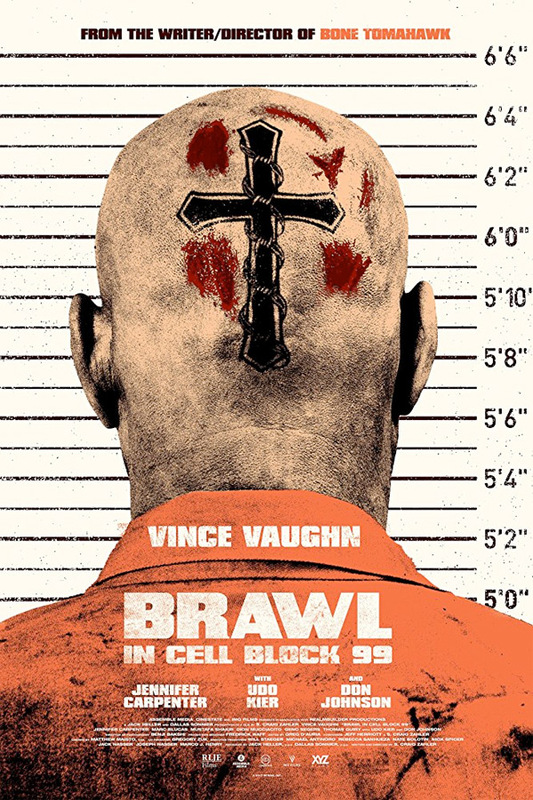 Brawl in Cell Block 99 is written and directed by up-and-coming American filmmaker S. Craig Zahler, of the film Bone Tomahawk previously. The film will premiere at the Venice & Toronto Film Festivals and Fantastic Fest first, so expect lots of buzz. RLJ Entertainment will then release S. Craig Zahler's Brawl in Cell Block 99 in select theaters starting October 6th this fall. Who's in?